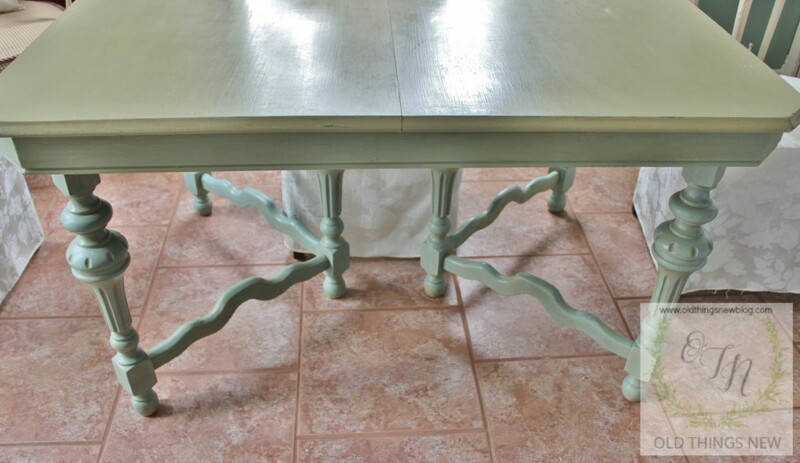 Shabby Kitchen Table . . . You’ve Stolen my Heart! My Shabby Kitchen Table has been used in many a photo shoot here at Old Things New, but I don’t believe she’s ever had her very own feature! I guess it’s about time since this was one of the first pieces I ever painted with chalk paint. She is a great table with lovely legs! I recognized her potential right away even when I first found her painted gold and sealed with grime! I was so excited to bring her home and give her a fresh new look. The best thing about this dining table is that she easily goes from being a table for four . . .
. . . to a table for six, simply by pulling up the built in leaf! It is always so hard to find a place to store table leaves when they aren’t in use. I think whoever came up with this idea was simply brilliant! 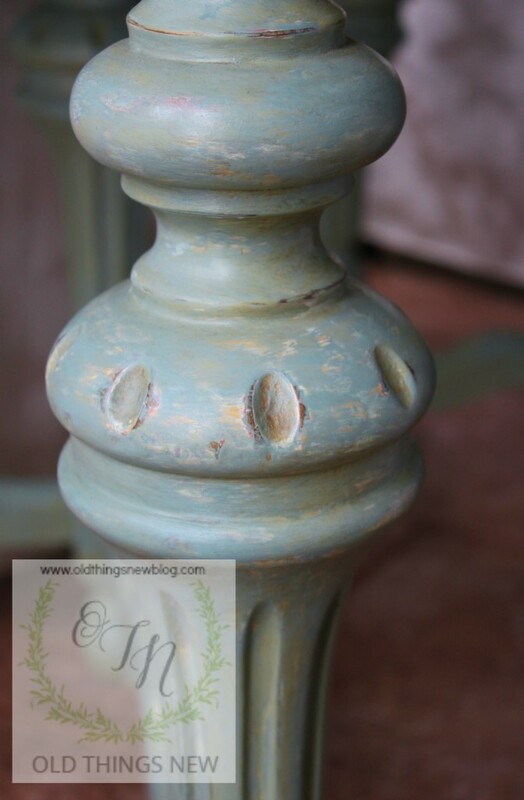 This was another paint project that was done by layering and mixing different colors of Annie Sloan Chalk Paint . . .
. . . then distressing with a damp cloth before the paint dried completely . . .
. . . and distressing a little more with a sanding sponge before sealing with wax. I was so pleased with the way the layered colors came out and the soft sheen of the wax. 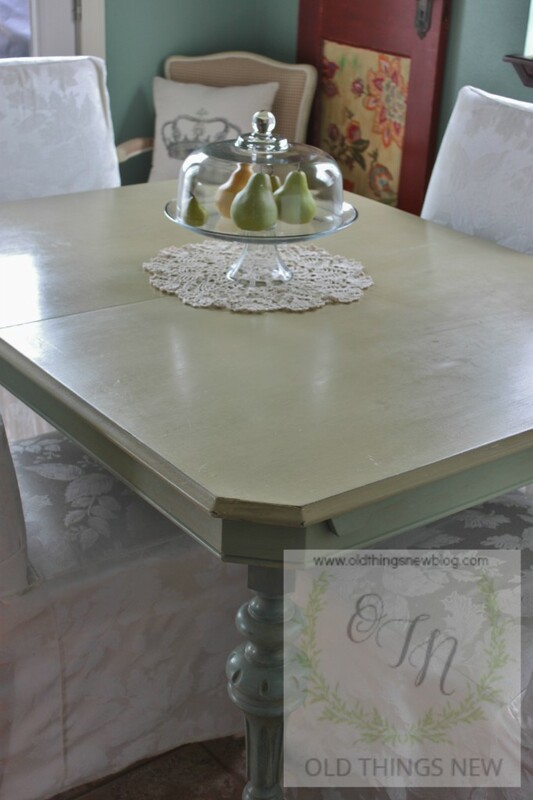 I’ve thoroughly enjoyed this little dining table and she has been perfect for our lake house. Since we’re moving cross country though, and need to lighten our load, she was sold at our flash garage sale last weekend. Note: We’ve found that cross country moving expenses are unbelievably high and I’m sad that I’ve had to part with quite a bit of furniture. 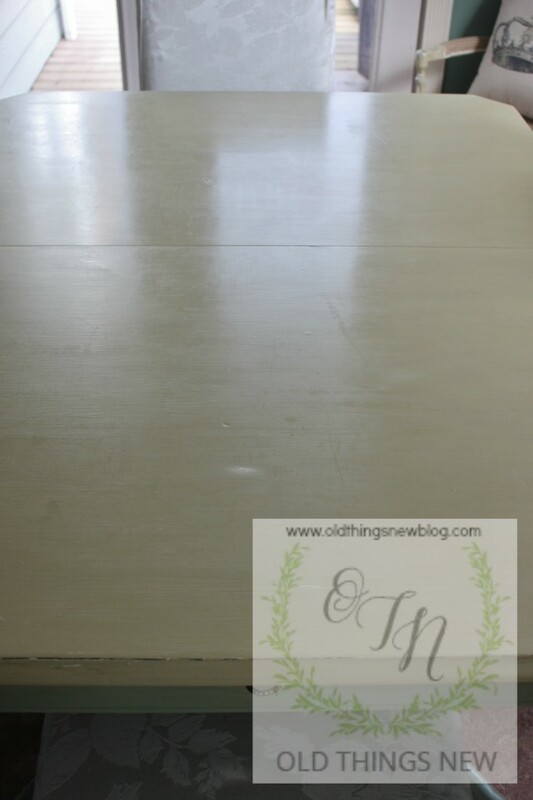 The upside is that I will be doing a lot of thrifting and antiquing once we get to our new home. Plenty of future material for Old Things New! It feels sorta funny (if funny qualifies as a feeling) to let go of this shabby kitchen table. I think even more so because as I look at this table I remember the many faces that have sat around it over the past several years. Parents, children, sisters and brothers, friends both old and new, my dear crafting buddies, some amazing pastors and leaders, Freedom Session facilitators and even many of our FS participants, who have poured out their hearts right here at this table. Wow . . . I don’t think there is a single piece of furniture that holds my heart quite as strongly as my shabby little kitchen table. I can only hope and pray that her new family will create as many fond memories around this table as we have. It is funny how we get attached to things, Patti! When we were moving and packing up and letting things go, I just kept reminding myself that it was the people that made the memory, not the thing. It helped me get through it one moment at a time. The house itself was very hard and I had to say it more and more often to myself, “it’s not the house, it’s the people”. It is a gorgeous table though. 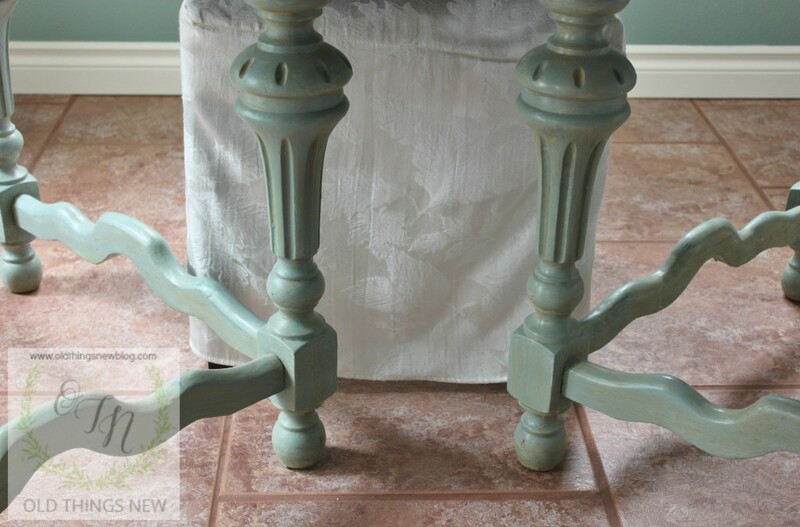 I have a chair with legs just like your table’s. I’d give up my table in a minute if I could find something this nice with this tuck away leaf feature (at a good price, of course). I remember we had to store our table’s leaves under the bed in one of the guest rooms. While I don’t have a need for a large table these days, every so often when I have everyone over it is nice to have a little bit extra room to spread out. 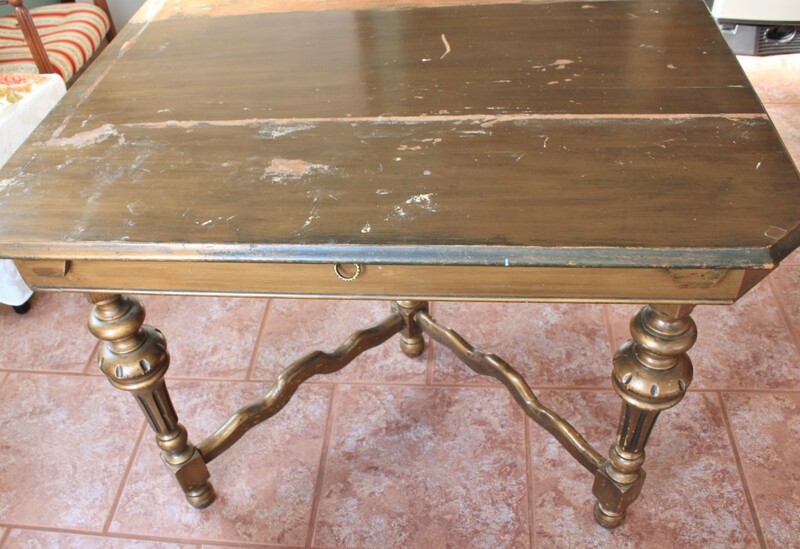 This precious gem of a table is exactly like my beloved paternal Grandmother’s table!!! Hers would have been the “before” photo! I understand how hard it is to part with furniture and the memories that they bring. stay close within your heart and thoughts, dear friend. Moving. Ugh. I got rid of SO MUCH when I moved, and I have SO MUCH still to deal with. So happy to have sat at your beautiful table. I’m sure it’s going to make another family very happy! You did a lovely job on the table. Sorry you had to let her go. I know I get really attached to my “stuff.” And I get even more attached if I’ve put my heart and soul into creating something wonderful. But it’s also exciting that you’ll be finding lots of new pieces to work your creative magic on. 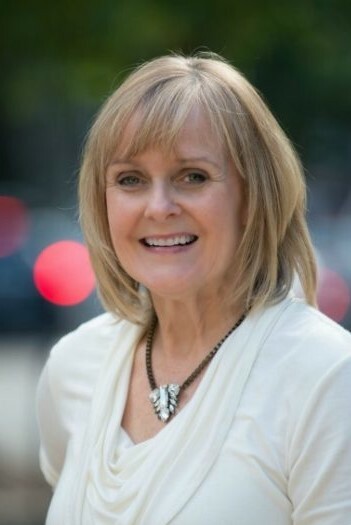 Visiting from Liz Marie Blog…and so glad I found you…Can’t wait to see what you come up with next! I love the way the leaves fold in. The color is beautiful and I’m sure the new owner will love it, too. First, let me tell you that I love your table! 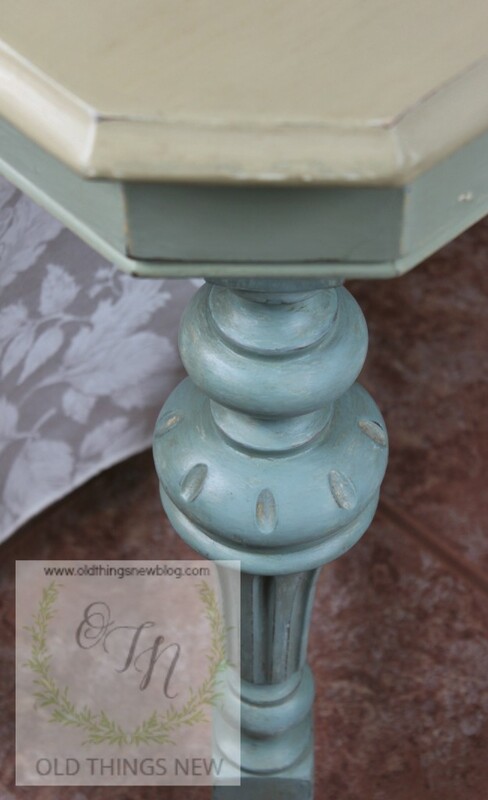 Second, I love Annie Sloan paint! With that being said…….I have moved about every few years and have dragged most of my stuff with me and picked up quite a few new pieces too! I am sure you will love, love, another piece just as much. Your memories will always be a part of you and you will make new ones too! I can’t get over how many things I have renewed and then sold and then bought new/ old things to replace the ones I sold. I think its just a process we go through…….times change and so do we. I’m not sure where you live or where you are moving to, but I wish you the best of luck! If you happen to come to Texas look me up! 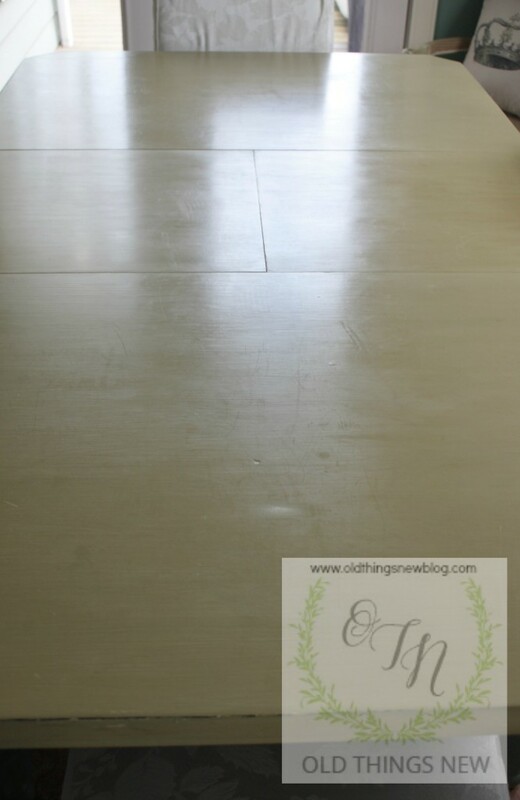 I would love to meet a fellow blogger who loves to redo things as much as I do! You have inspired me! Keep me posted! Those legs are to die for! And I love the colour(s) you chose. My very similar table is missing the extending part. 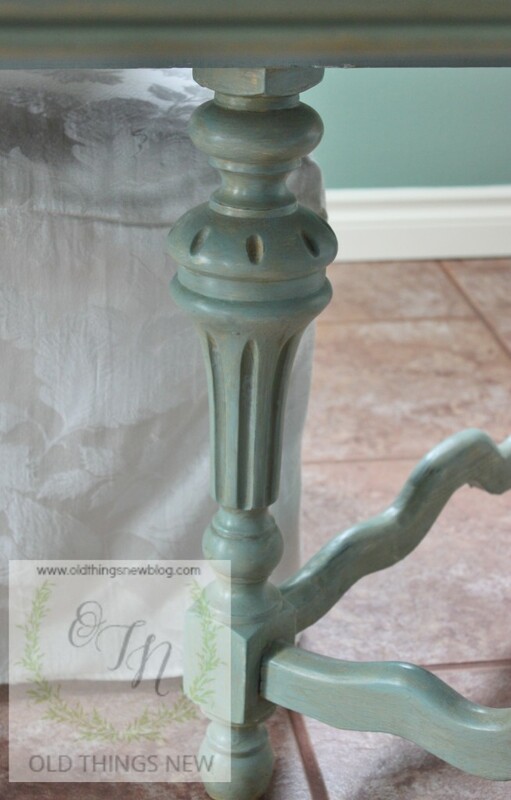 I painted it with Annie Sloan RED but am ready for a change. Like you at least until now I haven’t posted about the table. Kind of funny how the workhorse pieces are often overlooked. What a sweet table that must have been hard to part with. But, as I read about the deals people get on the east coast at thrift shops, you will find something new to refinish and create memories with. 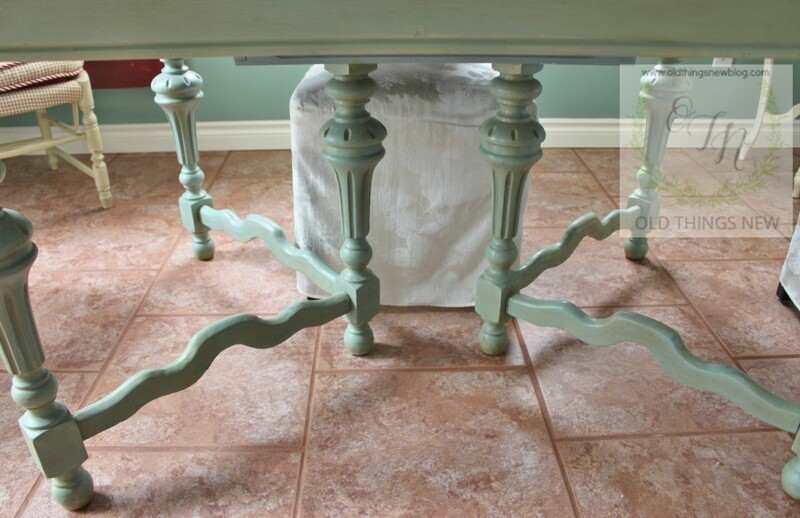 I love your table, it’s so incredible with the style and those legs. The color is fantastic. Can only imagine how hard it was to give it up, perfect. 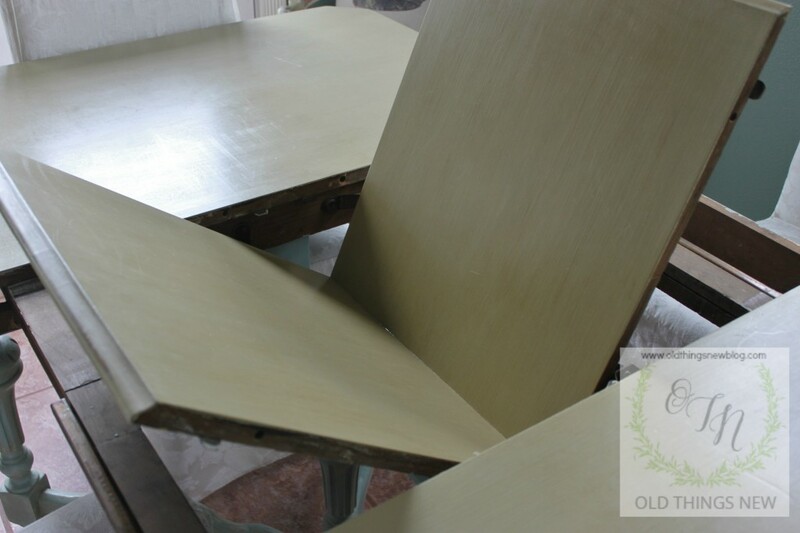 As others have said you’ll have great time finding new old stuff to redo for your new home. We had to let go many great pieces when we left KY I would so love to have now. We’ve done alot of moving cross country ourselves so know how hard it is to part with things. When we left MT I wouldn’t let myself look back or knew I couldn’t leave our 20 acres on lake. Still kicking myself. We moved to KY then I couldn’t handle the climate after 5 yrs. so had to move back west again. It is hard to let go of pieces that have so many memories attached to them. You did such a wonderful job painting it, I love all of the colors showing through. The detail on the legs is so pretty too! Hi there! I hopped over from Bouquet of Talent! Love your table. You really did a beautiful job! Safe travels to your new home where you will make many new memories with many old and new faces. Thanks for sharing at Inspiration Monday. Beautiful! You did a wonderful job! I love the patina. 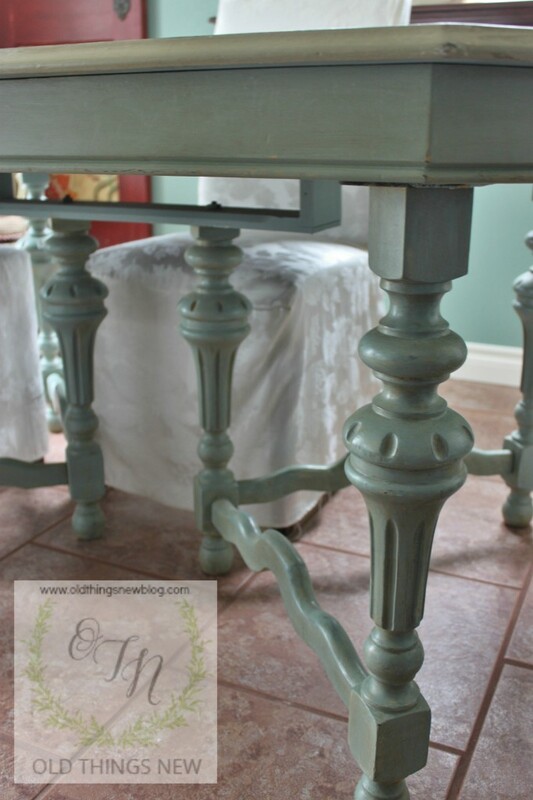 Patti, your shabby kitchen table is just gorgeous! I love the mixture of paints you used. Who ever came up with this creative leaf idea was a genius! Thanks for sharing with SYC.